It was a special privilege recently to spend ten days in the company of people who, when fate struck hard and reduced their life to rubble, pieced it back together so that they could gain as much joy and satisfaction from what remains as their circumstances allow. Life is precious to them, and remains so even in the face of dramatic physical handicaps, perhaps acquired so suddenly that their world was instantly shattered. In earlier phases of my life my sense of adventure had placed me in precarious situations many a time. That sense of adventure had played a role here but, more importantly, I wanted to help a 90-year-old woman -- infirm but full of life and eager to travel -- to fulfill her heart's desire to go on a real journey again. This brought me into contact with a world that, until then, had been little more than theory for me. Although I am not disabled myself, or one of their helpers, on this trip I was one of them, admitted to a realm with no false appearances and glamor, in which stark reality, fully accepted, is on display. One sunny morning, a few hours after the summer solstice, we all set off, full of expectation, in a specially equipped coach. 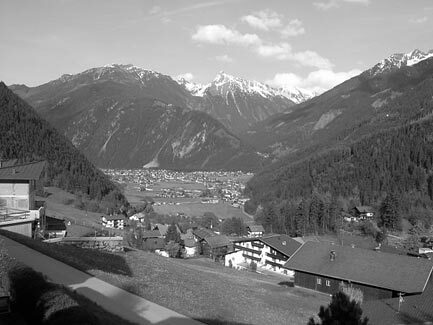 Our destination was the Ziller Valley in Austria, where we were due to arrive in eleven hours. It was a marvelous group of nearly thirty people, but for the unprepared, unsuspecting, superficial observer who sees no more than the top of the iceberg, it was a shocking sight. Those able to do so had got on the coach by themselves, but most were helped inside using the lift, sitting in their wheelchairs or other marvelous inventions which, once in position, were firmly secured, ready for the journey. With a merry, confidence-inspiring driver and the exciting adventure ahead, everyone readily slipped into a holiday mood. A nod and a smile, where appropriate, to the still unknown traveling companions, is the first step towards getting acquainted. After four hours' drive comes the first stop: Wurzburg. This means unfastening all the wheelchairs, descending with the lift, and helping everyone out of the coach -- a procedure that takes half an hour. In the 100 meters from the coach to the restaurant I got an initial impression of the disabled travelers and their helpers: a procession of wheelchairs, motorized conveyances, and supervisors on foot. The first, most urgent goal was the restroom -- an operation in itself, in which nearly everyone had to be helped. Then came the meal: a busy, colliding, searching colony of human ants in the spacious restaurant, with delicious dishes in abundance. Everyone found a table and was given something to eat; some had to be assisted. A man and a woman came and sat down at my table. She was one of those people who have "nothing wrong" with them. The same could not be said of her husband. He shuffled up in a wheelchair, and sitting down was quite a task. He was a gnome-like figure, the upper part of his body bent forward ninety degrees so that he barely projected above the table. His nose and the rest of his face were horizontal, and his open mouth was at the same level as his eyes. Later I noticed that he had difficulty finding his mouth with his spoon or fork, and it was only logical that saliva constantly trickled from the corner of his mouth; you can't swallow all the time. I never saw his wife help him eat -- he managed it himself. The same applied to getting into and out of the coach; it seemed that she left him to muddle through. But she did help him to sit down. Being of service in the right way and at the right time is an art that you can learn only if the other person means something to you. At the table he told me that they had been married 56 years and that today was his 84th birthday. At the hotel that evening we all sang to him. I was never able to see his face properly, not even during our later conversations. But that was no obstacle to befriending the person in this broken body. I was astonished that I got used to his unusual appearance so quickly. The same applied, without exception, to all the people I got to know on this trip. Their ravaged bodies are the tattered flags behind which is concealed a brave soul which knows no surrender. They have never become subservient to their bodies, they have never surrendered control over the body-soul duo, not even when the body deployed every weapon available. As a result, all pretense and pride have been eroded from their souls. The soul has become like nature: itself. No wonder you grow accustomed to an unusual appearance so quickly once you get to know the noble soul within -- the image of the real self. After the first day the ice was broken and people got talking to one another without any ritual. Someone rolls up in a wheelchair and soon you know the most important details about his or her life. Everyone wants to tell their story; it's easier to do so to people you don't know, as they listen better. This morning, on the broad terrace with the fairytale mountain scenery before me, I had a chat with a woman who was accompanying a man in a science-fiction-like wheelchair that stood beside her. There was a strange piece of equipment on either side of his head, and there were all sorts of devices in front of his head and behind it. Moving and talking were impossible, but he could see and hear normally. The thinking and feeling person within could therefore pick up signals from the outside world and process them with his intact mind, and he was able to give a minimal response, thanks to the ingenious equipment. By making very slight movements with his head, he activated characters on a small screen in front of him. In this way, and through the look in his eyes, he communicated with his wife, who understood everything. She told me how their life had changed so drastically. Seven years ago something happened to her husband's brainstem, causing all his muscular and nervous functions to fail. He remained alive, and when his situation eventually improved slightly she decided to take him home so that she could be with him and care for him herself as much as possible. Gradually the limitations were accepted and they learned to be satisfied with the opportunities that remained, which were sufficient to lead a dignified existence. Their life had assumed a new form, and now they were both greatly enjoying their holiday. Inspired by love, and with will power and discipline, they have opened the next page in the book of life and are busy writing it with fresh courage. By maintaining and caring for the battered body, the beloved soul remains within reach. In this way both are assigned exactly the importance they deserve. The caresses to which the body is entitled were and are in fact an ode to the soul. Their familiar world had collapsed. But even though their situation seemed hopeless, they never gave up. They continued to resist what looked like blind fate and were able to save the most important thing of all: the meaning of their existence. They didn't fall into the endless refrain of "why me?" It must have been experience rather than imagination that prompted Carlyle to write: "From the lowliest depths there is a path to the loftiest heights." My traveling companions have found that path, and although they may not yet have reached the greatest heights, they are making fearless progress and have already abandoned a great deal of excess baggage. A tree is not dead if a new shoot emerges from the sawn-off trunk; the life of a human being is not over if he begins anew after a catastrophe. The question is how strong is our will to live, the power that decides whether we give in or hold firm. Everyone is entitled to his or her own outlook on life and receives from mother nature the appropriate lessons -- and always another chance. We all follow the path of necessity -- karma. In the great scheme of nature there is no escaping the effects of our actions. The consequences depend on how we ourselves shape them. This means we have the right and the power to create our own heaven or our own hell. As students of life, with our own mental and physical defects, are we not all disabled? Cowardly, brave, or lukewarm, we are all, in our ignorance, trying to make something of our lives. What happens as a result offers us opportunities to learn. If we make good use of them, we become worthy representatives of humanity, our ignorance lessens, we shorten our suffering, and are on the way to final liberation. Every day the weather was wonderful and we went on an excursion. The trip on the funicular railway to an altitude of 2,000 meters, drinking coffee there, the Alpine meadows with the beautiful gray calves -- all will long remain in their memory. The two blind young men went with us of course. Although they did not see the breathtaking panorama, they experienced everything in their own way, as they said themselves. Simply being there, away from the daily grind, in the company of others -- that was the main thing. The Tyrolian festival evening, in the middle of the holiday, was one of the highlights. Parties of this kind hold no attraction for me: there is too much noise and outward movement. But I was unable and unwilling to miss it. In this case, my attitude proved to be a prejudice and I abandoned it as soon as the party began, once my enthusiastic companion and I had found a quiet place to sit. The people gathered here came from a world where nobody needed to keep up appearances. In their trials, they had lost their masks and showed their true faces, undisturbed. A sort of dance floor had been created in the dining hall by moving tables and chairs to one side. A musician with a guitar and one with a harmonica, with the help of their voices, brought the place to life. Everyone participated in their own way -- not just a little bit but with full abandon. The music got everything and everyone moving, wheelchairs circled around, paralyzed arms were moved to and fro by helpers in time to the music, those seated were embraced and half swung round. Everybody took part -- it was a wild affair! The conga was performed twice: a procession of wheelchairs and people moved and hobbled through corridors and rooms, waving and singing. Then I saw the two blind young men standing beside the musicians, each playing percussion by clinking two spoons together. People in their 80s forgot their age and danced like they did in days gone by. My singing 90-year-old companion became several dozen years younger -- it was an evening to remember! She was unable to stop. But eventually it had to end. Gradually one wheelchair after another disappeared, together with a caregiver, to take the lift upstairs, and finally my own companion did likewise and I was able to go to my room, enriched by an unforgettable experience. At what hour the lights went out I do not know. Each of the caregivers and helpers stole my heart. With their dedication, patience, and warm humanity, they showed that brotherhood in action is a blessing. On the final evening the tour leaders announced the "holidaymaker of the week" -- a bit like awarding an Oscar. It could have been any of them, as they each deserved first prize. Who would it be? It was quite exciting, for the game was genuine, like everything else in their lives. The paralyzed husband and his wife won the well-earned honor. They were applauded, congratulated, kissed, and the woman wept genuine tears. That the game had become real was clear to my eyes too . . . This unexpected trip has taught me to look at disabled people with different eyes. I now find that if I meet them on the street or see them on television a spontaneous feeling of sympathy wells up inside me, a sense of familiarity, as if to say "we know each other"; the imagined remoteness has simply vanished. A battered body quickly becomes familiar; look past it to the soul that shines through it and you will make discoveries.